Rebecca: How did you become a mermaid in Phuket, Thailand? I started working as a model and traveled around the world. In 2010 my husband Spencer and I left Germany. We lived one year in Australia and are now in Thailand since last September. We're working as scuba instructors and started free diving. The contact with the underwater world reminded me of my childhood dream and I again wanted to become a mermaid. I did some research and I found my first mermaid tail on the internet and was really excited. "Mermaid Kat" was born! Mermaid Kat: Swimming around Phuket is just beautiful! The water is between 27 c and 20 C. The visibility is really good for the most part and the underwater world is amazing. I love all my friends but one of the most amazing experiences was hearing dolphins talk to each other. Everyone knows this noise from movies but to hear it underwater in real life out there in the ocean is just so different. Rebecca: Being a professional diver must give you great insight into the underwater world. Please tell us about being a diver, scuba instructor, and experienced buddy breather and how those talents have aided in your mermaid career. 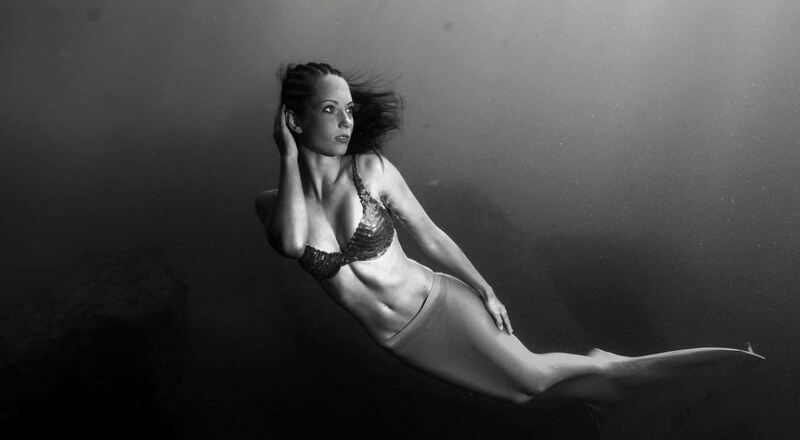 Mermaid Kat: Being a diver gives me the opportunity to visit the beautiful underwater world at my leisure. Being deep in the water is a much different experience than seeing it on TV or in an aquarium. You start to learn buddy breathing from the dive master level on. It comes in handy at certain locations for photo shoots and videos. However, in order to use it as a mermaid it requires a lot of skill and so I don't recommend anyone doing this without proper training as it can be very dangerous! To work as a scuba instructor makes it possible for my husband and myself to live close to the ocean and be underwater all of the time. After diving for a while you build a "relationship" with the animals that live there. You know what they do, how they live, how they react, etc. I now have a really deep friendship with many of them. Being a diving instructor gives me the opportunity to not only teach people how to scuba dive, but I also have the chance to give them information about the ocean and wildlife, in addition to educating them about topics that affect the ocean like pollution. I teach them about fishing, shark finning, and how YOU can make a difference even with the smallest effort. For example, none of my students are allowed to touch or feed anything underwater. We are just visitors in the underwater world and should treat it with respect! ever have a bug on your back you will understand that irritation. Think about a turtle and what he must think if some diver or mermaid comes along and touches his back. That's not cool!!. We all know it's great for youtube and publicity but we should be role models and are the ambassadors of the ocean and if we touch things why shouldn't others do it ?? If we really truly love the oceans with all its beauty we should enjoy it without disturbing it for our own personal benefit or for publicity!!! Mermaid Kat: No, unfortunately, not so dar. I'm still hopeful! I have the feeling that real mermaids exist but because of all the terrible things the humans are doing they are shy and don't show themselves to us. I hope they are clever enough to keep this up. Otherwise, the people would put them in aquariums or start eating mermaid fin soup. Rebecca: What do you think the relationship between pirates and mermaids would have been in the wild? Mermaid Kat: I think that mermaid wouldn't show themselves to humans even if they were Pirates. But, there may always be that one mermaid who falls in love with a sail out at sea. Rebecca: What do you think the allure and fascination are with mermaids in today's culture? Mermaid Kat: I think most people like mermaids. You know them from movies, books, and stories. They are mystical and beautiful. And especially at this time, I think mermaids have got a completely new meaning to many people as there are now real women and girls that swim in a mermaid tail through the ocean, like me. Rebecca: I know that your mission is to inspire children and adults to fulfill their dreams and educate them about the ocean. How does being a mermaid allow you to accomplish this? Mermaid Kat: I'm a 27-year old mermaid showing the world that it's never too late to live your dreams. I also married my husband after 5 weeks, left my home country, and we are now living in paradise. I can't remember how many people told me," Kat you have too many dreams....they will never come true." And I think it's better to have a hundred dreams instead of just one. I may be a dreamer but to be honest... if just 10% of them come true it is still more than those who just have one dream and can't make it happen. Rebecca: Very inspiring Mermaid Kat! And what about education? Mermaid Kat: I think being a mermaid gives me a really good chance to bring people even non-divers in contact with the underwater world. In May, I was swimming in the shark tank of Pattaya, Underwater World, Thailand. Of course, I don't like it when animals can't live freely but it was a good opportunity to improve the bad image that sharks have. Just because of Hollywood many people think that sharks are some kind of monsters. That makes me angry !!! I see them often underwater and they are beautiful creatures which have to be protected. Every year about 72 million sharks get slaughtered for shark fin soup. If we don't stop this there won't be any more sharks in the ocean in just a few years. Spencer, my husband and I are working closely with the conservation organization "The Divetribe" to protect and preserve the ocean and the creatures living in it. We also try to open people's eyes with shocking campaigns like you can see in one of my pictures where it says " What if it were mermaids/ Stop "shark finning." Mermaid Kat had many years of hard training, got qualifications and experiences in modeling, scuba diving and freediving. Now the German mermaid is based in Perth, Western Australia. Here she works as an underwater model, mermaid instructor, and tail maker. Before Mermaid Kat turned into a real-life mermaid she worked as an international fashion model. She was crowned “Miss Germany International 2006” and “Queen of the World Germany 2007”. Mermaid Kat is a fully qualified and certified PADI Scuba Instructor. She is an AIDA Freediver and PADI Freediving Instructor with many years of experience. In August 2012 Mermaid Kat opened the world’s first public mermaid school. Now the Mermaid Kat Academy has branches in Germany and Perth, Western Australia.